Less than two hours after the Joplin (MO) High School graduation ceremony had drawn to a close on Sunday, May 22, 2011, a fierce EF5 tornado touched down on the southwest side of Joplin and swept eastward, leaving a path of destruction almost a mile wide and seven miles long. The death toll of 162 victims included Joplin Schools students and staff, while hundreds of staff members and student families lost their homes. Five district schools -- including the 2200-student high school and technology center -- and more than 60% of its aerial fiber had been destroyed. The following is a recount of the aftermath from Joplin Schools Technology Director, Traci House. Immediately after the tornado there was no telephone voice capability but we were able to text. I began contacting my 15-member technology department to determine if all were safe. Two of the tech guys picked their way through several blocks of town to reach our administration building, which housed all of our district servers. They found the roof torn off, and water and debris everywhere. We were unsure how the servers had fared since they were located in the basement of the building. At dawn on Monday morning, it took me an hour and a half in what usually was a 20-minute drive due to fallen power lines, trees, and vehicles that had flipped over in the middle of roadways. Three other tech department members arrived about the same time with flashlights in hand. We walked down the stairs to the basement to find a three-inch stream running through it. We held our breath as we opened the door to the server room. There was water on the floor and water coming down the walls, but we didn’t see any water hitting the servers. We had to get at least one server up and running to cover payroll. We knew some of our 1200 employees had lost loved ones and homes, so the last thing we could do was to tell our folks their paychecks would not be hitting their direct deposit accounts on the expected date. With help from eight employees, a generator from the building and grounds department, flashlights and plenty of muscle, we got the servers running and payroll complete. With this accomplishment came an epiphany: that if our personnel -- working with no power, crushed fiber optics, three-inch deep water, and dodging ceiling tiles the entire time -- were able to complete this task, then Joplin Schools would somehow survive this tragedy. Somehow. 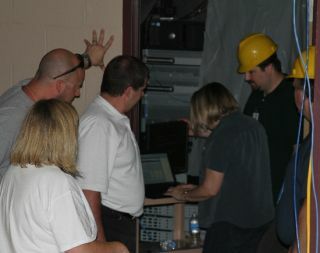 Although power was still down, we now had the ability to make our email server accessible to district employees. We took turns spending the night in shifts at the administration building to keep the generators filled with gasoline during the night. I took the first shift and put out on Facebook and email that any district employee could come by the building anytime to check email or Internet. Power was slowly restored to the buildings. But even working fast and furious to piece together our crushed network infrastructure, it would be next to impossible to complete necessary runs in the limited timeframe. That’s when I received a phone call from our Internet provider/consortium, MOREnet. The words “Let us help you get some T1s set up for your critical locations” were music to my ears. Our network guys configured and installed the components, and we now had network access to the necessary locations. Knowing the importance of our schools in the community's recovery, Superintendent Dr. CJ Huff decided in June that the 2011/12 school year would start on time: August 17, 2011. My team would have to move quickly to see that our district’s network was ready. With this challenge came another equally daunting task – Joplin schools had just received a $1 million grant toward the implementation of a 1:1 initiative at the high school. Since all high school textbooks were now gone, it felt like an ideal time to take this leap of faith. But to implement an open- source digital curriculum supported by 2200 MacBook laptops would require a great deal of professional development in a few short weeks. We had the plan - now we needed to implement it by opening day. After unloading the laptops, it took 25 people two full days to unbox each one. Even though they were pre-imaged, we still had to touch each of them for dual-boot and other requirements. We had extension cables running up through the ceiling to re-distribute power needs, but it still became so common to throw a breaker every few hours that even our volunteers knew where to go to flip switches. Our favorite volunteers came from our local colleges and universities -- without hesitation they gave up their evenings and weekends. We all worked like mad, united in our desire to not only open school on August 17th, but also to distribute the laptops on that very day. Nerve-racking would be an understatement in trying to describe this day. Now was the true test: did we have enough AP switches in the appropriate locations to ensure every student could wirelessly connect with their new laptop on our 100mb network? The media frenzy only added to the stress, along with the fact that Missouri Governor Jay Nixon was on hand to give out the first laptop. It is with great satisfaction that I say that our hard work and cooperation paid off -- the distribution was a complete success. I would never pretend that we haven't encountered our share of obstacles during the first semester. We have learned so much during this time; in fact, when I speak at conferences about this experience, a favorite is my handout of ‘DO’s and DON’Ts’. We admit where we went wrong as well as what we did right. Although the chaos of that summer remains surreal, we agree that we would not do a thing differently. As our superintendent has said repeatedly, our district will carry on and resolve to become even better as we owe this to the legacy of our staff member and students who lost their lives. Traci D. House is the Director of Technology for the Joplin Schools in Missouri.